Acil durumlarda kurtarma özelliği olan bir program. Bilgisayarınızda enerji kesildiğinde "screen of death" mavi ekran uyarısı alırsınız. İlk başta üzerinde çalıştığınız dküman hala mevcut diye düşünürsünüz. Ufak donanım sorunları harici dokümanın orada olma şansı vardır , Fakat en kötü senaryo düşünülürse endişelenmeye başlayabilirsiniz. Bir enerji problemi, bir virüs saldırısı veya sabit sürücünüzde bir hata sırasında veriniz mahvolmuş olabilir. 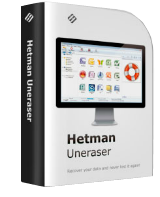 Hetman Uneraser bu tür sorunlar için geliştirilmiş bir programdır. Basit bir arayüz olarak Windows Explorer gibi hareket eden uygulama HDD, fotoğraf kamerası, USB cihazları, telefon hafıza kartları,ZIPler ve 3.5" diskler gibi modern legacy ortamlarda iş görnektedir. FAT16, FAT32 or NTFS gibi hangi dosya sisteminde çalışırsanız çalışın - Hetman Uneraser - verimli bir kurtarma programıdır. Program hakkında detaylı bilgiyi bu videodan öğrenebilirsiniz! Lütfen prgramın yarım senelik lisansa sahip olduğunu unutmayın! Windows 10/ 8/ 7/ 2008 Server/ Vista/ XP/ 2003/ 2000/ NT; 256 MB of RAM; Enough disk space for restoration of files; The administrative privileges are required. With a product name as specifically enticing as today's, I'm surprised the developer has gone for a domestic home-user audience instead of security and law enforcement agencies. Forensic recovery of over-written HDD data blocks is a time-consuming and expensive business; electron microscopes ain't cheap. At $18.63 retail, this uneraser of erased data is an astonishing bargain. Even at $1,863 retail it would be sought by all the above-mentioned. Actually: $18,630 would still suit the FBI's budget just fine. I'm almost tempted to DL and try to unerase that which has been erased from my hard drive. Almost tempted to find, in the wealth of verbiage penned by this developer, a single solitary example of an erased file or folder being recovered by Uneraser 3.9. It's tempting, too, to check out the version history of Uneraser from 1.0 to the present because a product's evolution says everything about its progressive refinement. Instead though, because I'm short of time, I'll leave the developer to come on here and tell me how $18sworth of software can feasibly attempt what even $100,000sworth of electron deep-scan forensic hardware has no guarantee of achieving. Though I take my hat off to Hetman for linking from its own website's "Expert Reviews: Reputed computer publications and data recovery laboratories recommend using our software. See the independent experts' opinion" to a, er, recommendation which demolishes its own product, I'm not going to be able to un-erase from my mind the notion that this software isn't ever going to do what it says on the tin -- and that if it can't even live up to its own self-description, then no 6-month trial is going to alter that. Thanks, GOTD, and Hetman. But no thanks. With a product name as specifically enticing as today's, I'm surprised the developer has gone for a domestic home-user audience instead of security and law enforcement agencies. Forensic recovery of over-written HDD data blocks is a time-consuming and expensive business; electron microscopes ain't cheap. At $18.63 retail, this uneraser of erased data is an astonishing bargain. Even at $1,863 retail it would be sought by all the above-mentioned. Actually: $18,630 would still suit the FBI's budget just fine. I'm almost tempted to DL and try to unerase that which has been erased from my hard drive. Almost tempted to find, in the wealth of verbiage penned by this developer, <b>a single solitary example of an erased file or folder being recovered by Uneraser 3.9. </b> It's tempting, too, to check out the version history of Uneraser from 1.0 to the present because a product's evolution says everything about its progressive refinement. Instead though, because I'm short of time, I'll leave the developer to come on here and tell me how $18sworth of software can feasibly attempt what even $100,000sworth of electron deep-scan forensic hardware has no guarantee of achieving. Meantime, if need arises today for me to recover an inadvertently <b>deleted</b> file or folder from my hard drive, I'll use Piriform's always-free Recuva. It doesn't promise to un-erase anything, but at least seems to manage things rather better than Uneraser 3.9: <i>"Unfortunately, this program isn't capable of recovering the files you lost after the storage device was damaged or infected, the disk was formatted, or the Recycle Bin's items were deleted." </i> (Ashley Griggs, Software Informer): http://downloads.informer.com/hetman-uneraser/ Though I take my hat off to Hetman for linking from its own website's <i>"Expert Reviews: Reputed computer publications and data recovery laboratories recommend using our software. See the independent experts' opinion" </i> to a, er, recommendation which demolishes its own product, I'm not going to be able to un-erase from my mind the notion that this software isn't ever going to do what it says on the tin -- and that if it can't even live up to its own self-description, then no 6-month trial is going to alter that. Thanks, GOTD, and Hetman. But no thanks. Hmm...this thing can't even recover items deleted from the recycle bin? I had a high school coding project that could do that. Should be a fundamental capability for any un-eraser. Got ''Installer Integrity Check Failed'' message - never seen that before. Any fix? Also downloaded it from their website but doesn't register with the GOTD key. "Please note, the program includes a half year license!"